Text: Ostensibly studying law in London from 1990 to 1992, I was in fact, despite myself, studying cinema — but strictly as a naïve autodidact. I kept up with Dilys Powell’s last pieces in the Times and followed Derek Malcolm (The Guardian) and Nigel Andrew (FT), yet my textbooks of choice weren’t those of Pauline Kael or Andrew Sarris but a fat Halliwell’s Guide and Time Out listings. Arrogantly — and wrongly — I doubted I could learn from the page something I couldn’t learn better from the screen. I shunned Sight & Sound because I didn’t trust it; it felt to me like uppity English critics “playing cinema.” For my freshman and sophomore years of film education, London was a vital, liberating platform, but I spent the following two years studying at the Sorbonne in Paris, whose infrastructure was, by comparison, simply awe-inspiring. 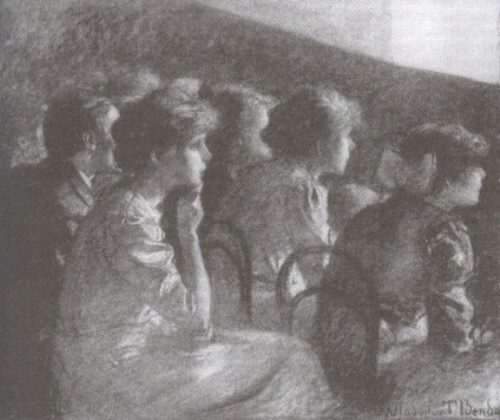 Paris was a city whose Latin Quarter theaters alone (Action Écoles, Grand Action, Action Gitanes, Champo, Épée de Bois, Reflet Medicis, Pantheon, Studio Galande) had repertory programmes which obliterated London’s entirely, replete with massive retrospectives — all Chaplin, all Welles, all Renoir, all Fellini, all Ozu talkies — relentless, heaving listings, subsidized festivals of film cropping up all year round (e.g. Arabic film, children’s film, slapstick, German expressionist, etc.) and even on one Sunday morning, twenty Tex Avery shorts in 16mm. Emboldened by the known pedigree of French film writing, I also started reading criticism properly in Paris: Trafic, Cahiers du cinéma, Positif, Les Inrockuptibles. Paris was a homecoming of sorts because I had first succumbed to the idea of cinephilia at age sixteen during a school year in France when I had been struck with admiration at how seriously films were being taken, by comparison to England. By the time I got to college in London in 1990, eager to indulge this new obsession, cinema had become for me an antisocial, self-indulgent, and, above all, solitary pursuit. It was a secret I didn’t feel any urge to share. I got into films neither to fit in (no one I knew was interested) nor to make new friends (the idea of being part of a “film community” would have been insufferable to me then, even had there been one) nor to stand out from the crowd (being a film buff isn’t crazy to civilians, just dull). I wasn’t even particularly keen to talk to people about films, I was just interested in consuming them: greedily and without restraint. Going to the pictures whenever I wanted, without having to ask permission, was freedom. It was also an addiction to something that both felt good and — unlike most addictions — healthy. Going two or three times a day instead of going to lectures or getting drunk in the student union bar seemed not at all abnormal. In this respect, it was my good fortune to arrive in London just in time. The eighties had bitten down hard, and the repertory scene was on a gurney, approaching the operating table. TV channels had started showing films all year round, VHS rental shops had opened in petrol stations, and more than eighty percent of theaters in Britain had shut down or converted to bingo halls during the preceding decade. I arrived in the capital during a hiatus (which was later to be filled by DVD and the multiplex). In the early nineties, London’s remaining rep cinemas were slashing prices and recycling their stock in the hope of staving off the inevitable. The market followed: an impoverished student with a bus pass, like me, could englut himself. You can get a sense of the strangeness of early 90s filmgoing in London from one particular experience I had after a long Friday-night journey on public transport. I don’t remember (and cannot find) the name of the venue — an unprepossessing shack below a railway bridge in Acton, no trace of which now remains—but I promise you it existed. I vividly recall three things from my only trip there: first, you could buy beer in the foyer and take it into the screening; second, the image on the screen was from an old 80s LCD projector (an angry walkout-inducing observation today, a shoulder-shrugging reality then); third, I was completely alone in the theater for the entire duration of a double bill of Blue Velvet and Wild at Heart. Acton, a West London district straddling the boroughs of Ealing and Hammersmith, had once housed Britain’s largest cinema, the Globe, as well as the equally impressive Dominion — opened by Gracie Fields in 1938. Add to this the Crown in Mill Hill Place, the popular King Street Odeon, and the identity-disorder-suffering Cinematograph in Horn Lane (latterly the Kinema, the Carlton and the Rex), and Acton had been a beacon of London cinephilia right up until the 1960s. In 1990 you could watch a David Lynch double bill alone, on the world’s largest television (the only cinema now in Acton is the nine-screen Vue multiplex). The Everyman in Hampstead was more old-school, with a turn-of-the-century room, intermissions, and a posh café. Here was the scene of at least one lost Sunday: Pat Garrett and Billy the Kid and Once Upon a Time in the West, two films with a combined duration (IMDb confirms) just shy of 200 hours. The Phoenix in Finchley (memorable double: Odd Man Out and The Third Man) and the Rio in Dalston Kingsland (Thief and Manhunter) felt like Alamo-style strongholds in a cultural desert (i.e. North London, which to a South London–based student was only designed to house people who had chosen the well-trodden path of slowly dying of boredom). I mention all these venues first for the simple reason that—in one form or another—they survived. They remain, just as they were 20 years ago, vital repositories of revivalist and art-house cinema: affordable, energetic, devoted. As I write, Riverside Studios is about to close its doors for a major redevelopment. Less fortunate was the notorious countercultural fleapit, the Scala in Kings Cross, a mythically grimy room with an insalubrious past (the seats could have provided a handy training aid for the Environment Agency). They programmed Pasolini, Warhol double bills, occasional erotica, and, fatally, Stanley Kubrick’s banned A Clockwork Orange one too many times. Warner Brothers’ ensuing lawsuit bankrupted the cinema, and the site now stands as a concert hall, doubling as a ballroom for corporate events — thereby catering to a clientele that would never have gone near the place in the dirty days. The Lumière in St Martins Lane (less a rep cinema than a straight art house) was probably my own favorite place to see a film, even if it was costly and, unlike the Riverside, only showed one at a time. It was a vast, antiseptically clean but actually quite gorgeous modern cinema associated with art-house VHS distributor Artificial Eye (its plush seats were even in the teal green of their logo) that programmed principally modern French cinema, and it was, perhaps most importantly, nearly empty whenever I went. As rents went through the roof it became laughably unviable and closed, to be replaced in the late 90s by a swanky, brutalist hotel. The older, more established, and unthreatened central London bastions of art house were the grand behemoth of the Curzon Mayfair in Curzon Street (one of the first cinemas to show foreign-language films of any description in the UK), its sister in Shaftesbury Avenue (now the Curzon Soho), and the Renoir (now the Curzon Renoir … you can see a pattern emerging) in the old literary quarter of Bloomsbury, north of Russell Square. These guys knew their onions, seemed somehow connected to continental cinephilia, and certainly programmed more Far Eastern cinema than anywhere else (even if that meant strictly Zhang Yimou and Chen Kaige, no Hou, Yang, or Imamura). The Renoir memorably showed Kieslowski’s Decalogue over five consecutive days. I visited these cinemas infrequently as they were extremely pricey, with Soho charging as much as £8 (around $14) for a ticket for a new release (no student concessions). The Curzon Group — a corporate success story — has now cornered the market in London art-house cinema projection since scooping up the Richmond Roundhouse (where I was once persuaded to see the Depardieu Cyrano de Bergerac with a glass of champagne for the exorbitant price of a fiver, or nine bucks), the Chelsea Cinema, and opening the Curzon Victoria this year. These venues are reverent, knowledgeable, and energetic, but remain very high end, expensive (£17.50 a ticket now — about $27 at today’s rates), and commoditized—like they have caught a new trendy wave of foreign filmgoing amongst wealthy Londoners—and the Curzon brand has all but said goodbye to any repertory ambitions its “assets” once had. Two cozy, cheapy destinations for new releases were the Ritzy in Brixton, South London, closest to where I was living (and they did flapjacks, carrot cake, and delicious coffee) and what probably remains the most vibrant venue in London today, the Prince Charles, off Leicester Square. The Prince Charles adopted a radical approach to staving off almost certain liquidation in 1991 by hitting on the instant theater-filling idea of showing mainstream hits you might have missed the year before such as — in my day — Robocop or Field of Dreams, before becoming a venue for interactive events such as sing-along The Wizard of Oz and fancy dress Rocky Horror Picture Show screenings. It has since evolved into something of a role model for independent picture houses: cheap, tatty, simple, confident, unpretentious, packed with listings and big on retrospectives. It harbors a continuing fixation on cult cinema and interactive programmes (Tommy Wiseau recently attended a packed “The Room quote-along”), but has also done full Wes Anderson and Coen Brothers retrospectives. A recent Ghibli Studios triple bill was a more than good enough reason for an Allen family trip into town. By contrast, purely through childish jealousy, I used to loathe the National Film Theatre — now the BFI — because to me it just represented money (which I didn’t have). Films were a pauper’s pursuit and to my mind, people with money and not much else joined and attended the NFT and watched films they had no business watching, after talking relentless, nauseating crap about them in the queues. I went once to see Frenzy with an introduction by Barry Foster, fantasized in line about the scene with Marshall McLuhan in Annie Hall, and didn’t return for ten years. When I did, my wife and I were “shushed” for laughing too loud at His Girl Friday, so I didn’t go back for another five. The ICA (Institute of Contemporary Arts) felt more like the real deal back then, but was unfortunately even more elitist, expensive, and inaccessible. Both institutions are alive and kicking today, unquestionably doing great things for film in the UK, but they still retain that aura which would have kept impoverished beginners like me well away. I go to the BFI more now and feel closer to it, but I remain confused as to what it really represents. I’ll still never forgive them for starting Barry Lyndon before they’d let in half the patrons, who’d been patiently queueing outside. A recent screening of L’argent in NFT2 was introduced by a very prominent British critic who didn’t know the film, didn’t appear to care for it very much and — most inexcusably — offered no valuable insight whatsoever. Who did he think his audience was—and was he right to underestimate them? There are only so many experiences of this kind one can have before questioning just how many of them were off-days. If we judge a religion by its places of worship, temples such as Bell Lighthouse in Toronto, Museum of the Moving Image and BAMCinematek in New York, and the Cinémathèque in Paris feel like confident expressions of — and testaments to — an ingrained culture. It will be a long time before London grows a coherent, identifiable film following that it can relate to as a city. The rents are too high and the public appetite for subsidy too low for its theaters to begin to take up the challenge. But as London — we are told — has become the world’s premier tourist destination, its cultural outlook, which for so long placed film in a corner, is gradually adapting to a more global movement of cinephilia. Social media has transformed the discussion: we see the signs of a genuine film community in Britain now, largely active online and being led by the regions, with notable festivals — Edinburgh, Leeds, Bradford, Cambridge, Sheffield docs, Bristol silents — gaining vital word of mouth from year to year and pop-up screenings such as Secret Cinema, Joanna Hogg’s A Nos Amours, the new ArtHouse in Crouch End, and the devoted Badlands Collective (who recently screened The Long Day Closes with a riotous guest appearance by Terence Davies, and are currently keeping Godard’s Goodbye to Language 3D alive on British screens). The improving stature of the London Film Festival (which though based at BFI, uses screens all over the City to showcase its venues) testifies not to a renewal — there was not much to renew — but to the gestation of a tangible, organically proud, and democratically accessible film culture. The time will soon come to revive the revival houses. Comments: Julien Allen is an attorney and film writer. The unprepossessing shack below a railway bridge in Acton was the Acton Screen (which I remember well). A Clockwork Orange was not banned as such, but was withdrawn from British screens by the director and Warner Bros from 1972 to 1999. My grateful thanks to the editors of Reverse Shot for permission to reproduce this article. This entry was posted in 1980s, 1990s, United Kingdom, Web texts and tagged A Clockwork Orange (1971), A Zed & Two Noughts (1985), Adieu au langage (2014), Annie Hall (1977), Barry Lyndon (1975), Blue Velvet (1986), Broadway Danny Rose (1984), C'era una volta il West (1968), Cinemas, Cyrano de Bergerac (1990), Dekalog (1989), Festivals, Field of Dreams (1989), Food and drink, Frenzy (1972), Gimme Shelter (1970), His Girl Friday (1940), Hygiene, Julien Allen, L'argent (1983), Laughter, Le genou de Claire (1970), London, Manhattan (1979), Manhunter (1986), Musicians, Nosferatu (1922), Odd Man Out (1947), Paris, Pat Garrett & Billy the Kid (1973), Pauline à la plage (1983), Prices, Projection, Raging Bull (1980), Rashômon (1950), RoboCop (1987), Salesman (1968), Shichinin no samurai (1954), The Draughtsman's Contract (1982), The Godfather (1972), The Godfather: Part II (1974), The King of Comedy (1982), The Long Day Closes (1992), The Rocky Horror Picture Show (1975), The Room (2003), The Third Man (1949), The Wizard of Oz (1939), Thief (1981), Wild at Heart (1990). Bookmark the permalink. Really valuable article from Reverse Shot. Energetically written, passionate, but it is a richly comprehensive look at the London scene in the early 1990s, a flourishing time for alternative cinemas that makes the London film theatre scene today look pale by comparison. Thank you. Still, nice to see some newcomers with cooperative programming like The Deptford Cinema beginning to appear again….